If you haven’t gone laptop shopping recently, you’re in for a big shock when you do. Recent consumer laptops are thin, powerful, surprisingly inexpensive, and Apple’s latest MacBook Pros even have a fantastic ‘Touch Bar’ – a touch-sensitive OLED display where the function keys should be. The greatest laptops ever made are available right now, and they don’t cost much, either. Unfortunately, the laptop as a platform is inherently a compromise. If you want a discrete CPU, or if you simply want to choose your own parts, you’re relegated to a desktop build. The middle ground between extensibility and portability isn’t really covered by case manufacturers, and even the rare ‘LAN party’ cases rarely have a handle. [Roger] is taking steps to solve this problem. 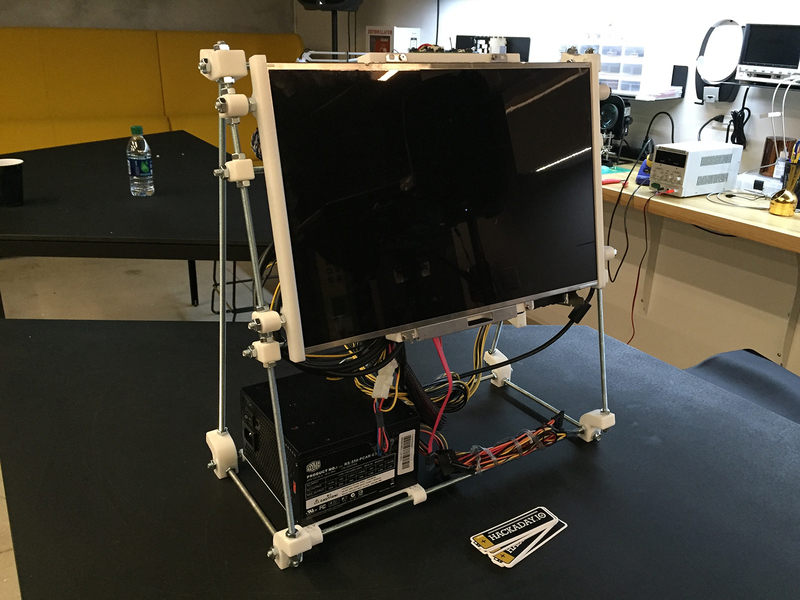 He’s designed a 3D printable luggable PC. Yes, now you can have a GTX 1080 and a 22-core Xeon in a form factor you can carry around. 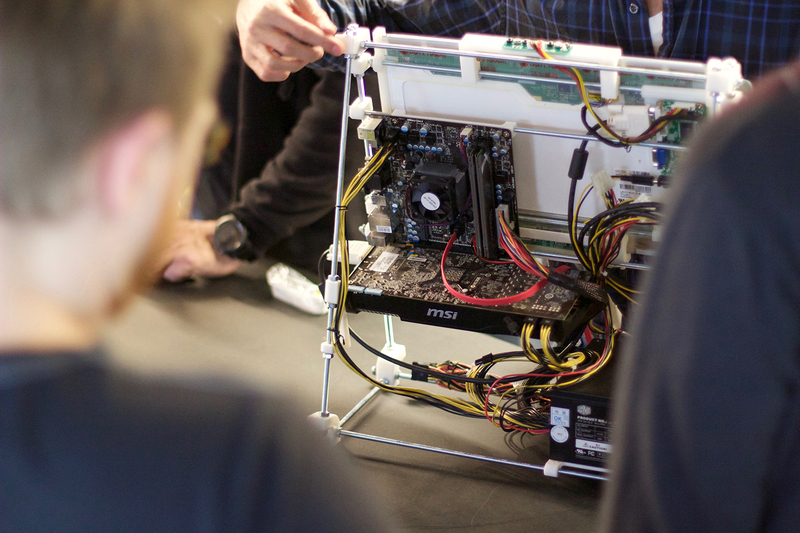 It’ll fit in the overhead bin on your next flight, and yes, the monitor is included. The construction of this DIY luggable PC should be familiar to anyone who built a 3D printer in 2011. It’s made out of threaded rods, with brackets for an LCD panel, ATX power supply, motherboard, and SSDs. Since this is effectively a modular system, you can load this case up with hardware. The included monitor in [Roger]’s build is taken from an old laptop and driven through an eBay “LCD Controller Board”. While a luggable PC might be a very niche use case, it is still one that’s vastly underserved. I recently built a new battlestation, and after searching for a case like this for a few months, I eventually gave up, caved in, and bought whatever Linus told me to buy. 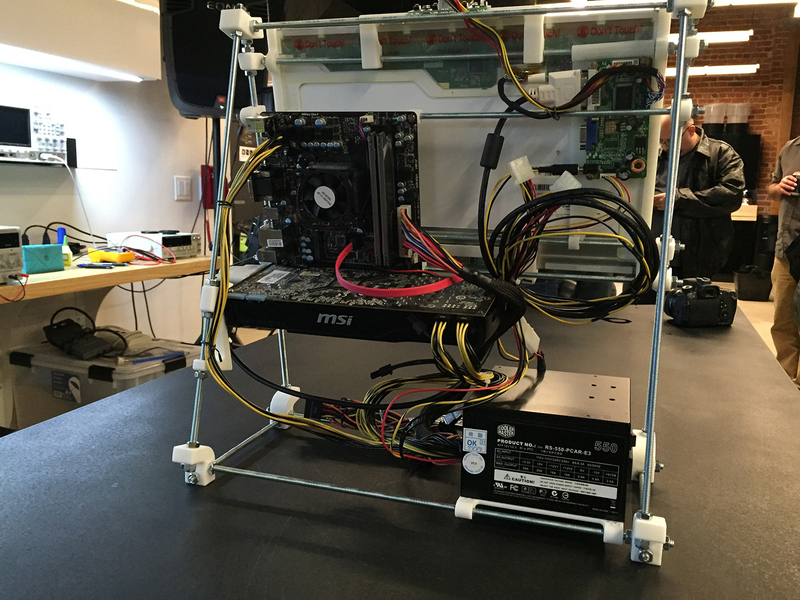 You simply cannot buy an ATX case that has a monitor bolted to the side, and [Roger]’s build is the first DIY solution we’ve seen. All the files to replicate this project are linked to on the [Roger]’s Hackaday.io project, and this would be an excellent basis for a community-based project to build an Open Hardware luggable PC enclosure. 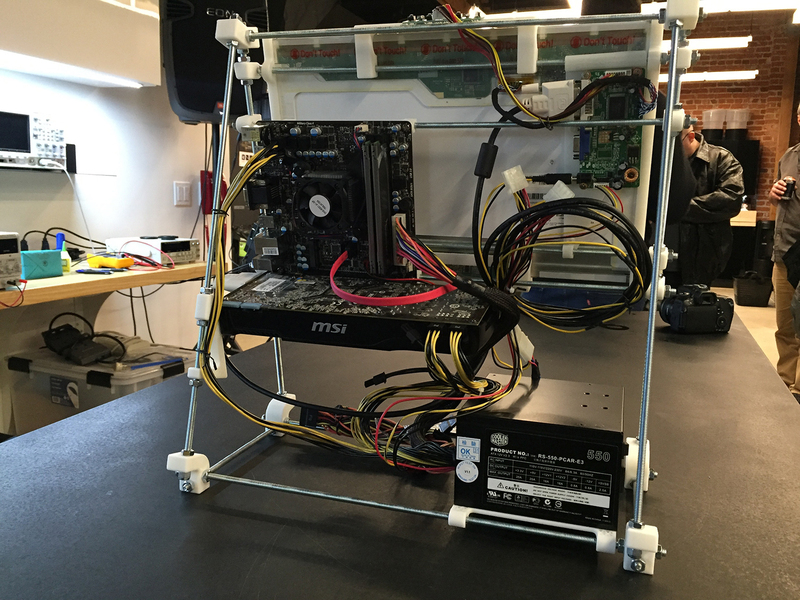 A few days ago, [Roger] brought this PC out to the Hackaday LA January meetup. He brought to the meetup on the train, providing more than enough evidence this is a truly portable PC. Check out the pics from the meetup below. A proper battlestation — or more colloquially, computer desk — setup can sometimes use a bit of technical flair to show off your skills. [fightforlife2] has shared their DIY ambilight monitor backlighting that flows through different colours which mimic what is displayed on the screen. [fightforlife2]’s setup uses fifty RGB LEDs with individual controllers that support the FastLED library, regulated by an Arduino Nano clone — although any will suffice. The power requirement for the display was a bit trickier, ultimately requiring 3 amperes at 5V; an external power brick can do the trick, but [fightforlife2] also suggests the cavalier solution of using your computer power supply’s 5V line — adding the convenience of shutting off the ambilight display when you shut down your PC! The best gaming platform is a cloud server with a $4,000 dollar graphics card you can rent when you need it. [Larry] has done this sort of thing before with Amazon’s EC2, but recently Microsoft has been offering a beta access to some of NVIDIA’s Tesla M60 graphics cards. As long as you have a fairly beefy connection that can support 30 Mbps of streaming data, you can play just about any imaginable game at 60fps on the ultimate settings. It takes a bit of configuration magic and quite a few different utilities to get it all going, but in the end [Larry] is able to play Overwatch on max settings at a nice 60fps for $1.56 an hour. Considering that just buying the graphics card alone will set you back 2500 hours of play time, for the casual gamer, this is a great deal. It’s interesting to see computers start to become a rentable resource. People have been attempting streaming computers for a while now, but this one is seriously impressive. With such a powerful graphics card you could use this for anything intensive, need a super high-powered video editing station for a day or two? A CAD station to make anyone jealous? Just pay a few dollars of cloud time and get to it! Looking to add some activity to your day but don’t want to go through a lot of effort? [D10D3] has the perfect solution that enables you to take a leisurely bike ride through Skyrim. A standing bicycle combines with an HTC Vive (using the add-on driver VorpX which allows non-vr enabled games to be played with a VR headset) and a Makey Makey board to make slack-xercise — that’s a word now — part of your daily gaming regimen. The Makey Makey is the backbone of the rig; it allows the user to set up their own inputs with electrical contacts that correspond to keyboard and mouse inputs, thereby allowing one to play a video game in some potentially unorthodox ways — in this case, riding a bicycle. We feel it’s healthy to cultivate a general desire for more neat tools. That’s just one of the reasons we like [doublecloverleaf]’s retro PC mouse. It certainly meets the requirement, the first computer mouse was wooden, and the mouse he used as the guts for this is so retro it belongs in the dollar bin at the thrift store. To begin with, [doublecloverleaf] took a picture of the footprint of his aged, but trustworthy laser mouse. Using the photo in SolidWorks he built a model of the circuit board, and with that digitized, a mouse that suited his aesthetics around it. The final model is available on GrabCAD. Edit: Woops, looks like we accidentally slandered a great Slovenian community CNC project. Check out the comments for more info. Original text in italics. Next came the CNC. It looks like he’s using one of those Chinese 3040 mills that are popular right now. The electronics are no good, but if you luck out you can get a decent set of mechanics out of one. He did a two side milling operation on a wood block, using four small holes to align the gcode before each step, and then milled the bottom out of aluminum. Lastly, he milled the buttons out of aluminum as well, and turned a knurled scroll wheel on his lathe. The end result looks exceedingly high end, and it would be a hard first guess to assume the internals were equivalent to a $10 Amazon house brand mouse. Gaming on a PC is obviously superior and you would be a fool to argue otherwise. The keyboard and mouse is the obviously superior input device, but there are times when you just want to play games on a couch. [Gabriel] has an interesting solution to this input problem in the second version of his KeyBall Controller. It’s a controller, but it leverages the superior layout and precision of the keyboard and mouse combo, without making any compromises. [Gabriel]’s KeyBall Controller began its life as several generic console controllers. The main body of is mostly a clone of the original Xbox S controller. Inside, there are parts from a clone SNES controller, a PSX controller, a generic USB trackball, and an iPazzPort USB handheld keyboard. The construction of the KeyBall follows in the tradition of the best case modders we’ve ever seen: cutting plastic, gluing plastic, applying epoxy putty, and lots of sanding. The electronics for the controller also follow in the most hallowed traditions of case modders: perfboard, hot glue, and many fine strands of wire. Inside the controller is a USB hub to connect all the different USB devices. It’s a great device that finally solves the problem of putting a traditional keyboard and mouse layout in the palms of your hands. There’s a truism in the security circles that says physical security is security. It doesn’t matter how many bits you’ve encrypted your password with, which elliptic curve you’ve used in your algorithm, or if you use a fingerprint, retina scan, or face print for a second factor of authentication. If someone has physical access to a device, all these protections are just road bumps in the way of getting your data. Physical access to a machine means all that data is out in the open, and until now there’s nothing you could do to stop it. This week at Black Hat Europe, Design-Shift introduced ORWL, a computer that provides the physical security to all the data sitting on your computer. The first line of protection for the data stuffed into the ORWL is unique key fob radio. This electronic key fob is simply a means of authentication for the ORWL – without it, ORWL simply stays in its sleep mode. If the user walks away from the computer, the USB ports are shut down, and the HDMI output is disabled. While this isn’t a revolutionary feature – something like this can be installed on any computer – that’s not the biggest trick ORWL has up its sleeve. The big draw to the ORWL is a ‘honeycomb mesh’ that completely covers every square inch of circuit board. This honeycomb mesh is simply a bit of plastic that screws on to the ORWL PCB and connects dozens of electronic traces embedded in this board to a secure microcontroller. If these traces are broken – either through taking the honeycomb shell off or by breaking it wide open, the digital keys that unlock the computer are erased. The ORWL specs are what you would expect from a bare-bones desktop computer: Intel Skylake mobile processors, Intel graphics, a choice of 4 or 8GB of RAM, 64 to 512GB SSD. WiFi, two USB C ports, and an HDMI port provide all the connections to the outside world. While this isn’t a computer for everyone, and it may not even a very large deployment, it is an interesting challenge. Physical security rules over all, and it would be very interesting to see what sort of attack can be performed on the ORWL to extract all the data hidden away behind an electronic mesh. Short of breaking the digital key hidden on a key fob, the best attack might just be desoldering the chips for the SSD and transplanting them into a platform more amenable to reading them. In any event, ORWL is an interesting device if only for being one of the few desktop computers to tackle the problem of physical security. As with any computer, if you have physical access to a device, you have access to all the data on the device; we just don’t know how to get the data off one of these tiny computers. Richard Osterloh liked LiPow - The USB C LiPo Battery Charger. karthik ram liked SnapOnAir LORA/GSM phone. karthik ram wrote a comment on Scope 2 Go. karthik ram liked Scope 2 Go. karthik ram wrote a comment on Smart Poppy. karthik ram liked Smart Poppy. karthik ram wrote a comment on MicroPython powered PLC. karthik ram liked MicroPython powered PLC. karthik ram wrote a comment on SHOKI Mobile Robot Platform. karthik ram liked SHOKI Mobile Robot Platform.